Hundreds of protesters gathered in central Charlotte today beneath the hot sun. 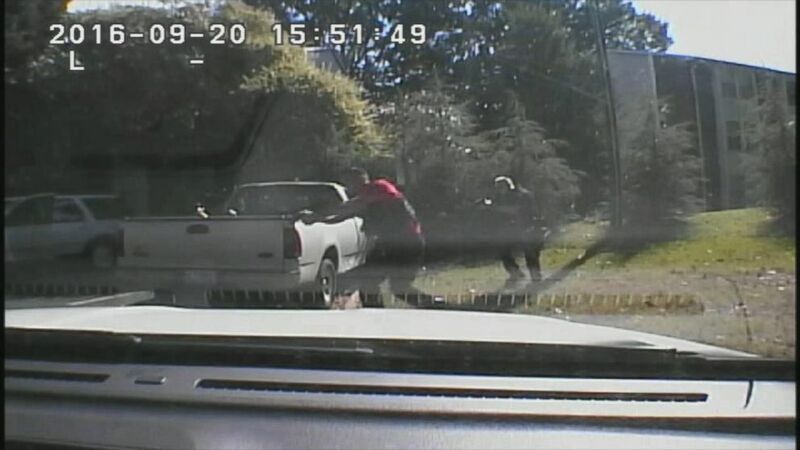 Charlotte-Mecklenburg, North Carolina, released some of the department's tapes of the fatal shooting of Keith Lamont Scott, which has sparked days of protests across the city. Police Chief Kerr Putney announced the release at a news conference today, saying that other footage will come later. In the dash cam video Scott is seen exiting his car, he then walks backwards with his hands before four shots are heard. It is unclear whether there is anything in his hands. The video was released by Charlotte-Mecklenburg, North Carolina, police in the shooting of Keith Lamont Scott. The actual shooting is neither seen nor heard in the body cam footage. Officer Brentley Vinson, identified by police as the officer who shot Scott, cannot be seen firing his weapon in either video. The chief says the tapes show that Scott was "absolutely" in possession of a handgun and will offer "indisputable evidence" of the department's account, and he said that at this point, he the Charlotte-Mecklenburg Police Department will not be charging any officer in the shooting. The North Carolina State Bureau of Investigation is also investigating the case. Police also released photos of a handgun and holster and of a marijuana "blunt" that were taken as evidence in the case. 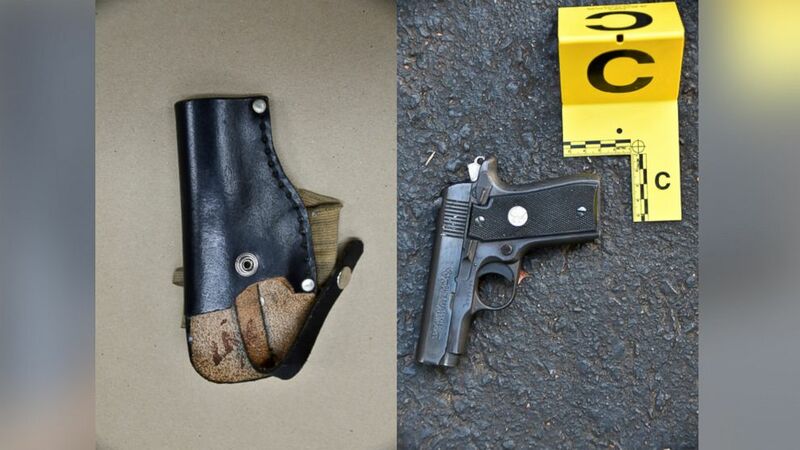 (Charlotte-Mecklenburg Police Department) Photograph of a gun and holster Charlotte-Mecklenburg, North Carolina, police say they recovered as evidence after the shooting of Keith Lamont Scott. 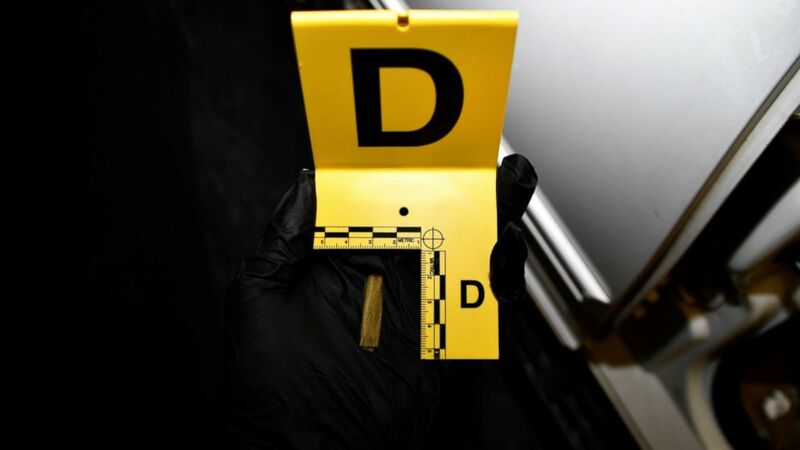 (Charlotte-Mecklenburg Police Department) Photograph of a marijuana "blunt" Charlotte-Mecklenburg, North Carolina, police say they recovered as evidence after the shooting of Keith Lamont Scott. Putney said officers were conducting surveillance related to a warrant they intended to serve on someone else, but their attention was drawn to Scott. They saw marijuana and a weapon in Scott's car and said believed, "this is a safety issue for us and the public," the police chief said. He said Scott was shot after he did not follow police commands to drop his weapon. "At every encounter, people can make a decision to follow loud, verbal commands. They (officers) were reacting to what they saw and they have a duty to do so," Putney said. He added that he believes the footage can now be released without jeopardizing the investigation. Ray Dotch, Scott's brother-in-law, said at a press conference this evening that the family was glad that the body camera and dashcam videos have been released but added that unfortunately the family is left with more questions than answered. Justin Bamberg, a lawyer for the Scott family said, that they appreciate that their request for the video release was heard and that it is another step in the pursuit for all the facts, but said that in his opinion, he does not see Scott look aggressive or lunge at officers. Charles Monnett, another attorney at the press conference said that the community should express their opinions but should do it lawfully and peacefully. 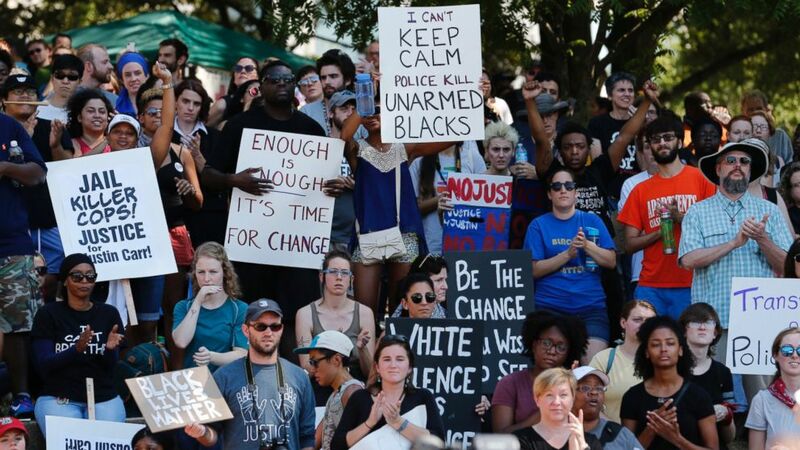 The police announcement came after hundreds of people gathered in Charlotte's Marshall Park demanding the release of the police video footage, marching peacefully under the hot sun in, chanting and holding signs that said "Release the Tape." (Jason Miczek/Reuters) People cheer at a rally at Marshall Park to protest the police shooting of Keith Scott, in Charlotte, North Carolina, Sept. 24, 2016. Calls to release the footage had intensified after Scott's family released cell phone video of the moments leading up to and after the shooting Tuesday. A woman identified as Scott's wife, Rakeyia Scott, recorded the incident with her phone and the video was provided to ABC News on Friday by attorneys for the Scott family. In the video, Rakeyia Scott can be heard pleading with police to not shoot her husband, a 43-year-old black man, as officers order the man to "drop the gun." As the encounter continues, the woman yells back at police, insisting her husband is harmless and doesn't have a weapon. Police repeatedly scream at Keith Lamont Scott to "drop the gun" and, moments later, multiple gunshots ring out. The actual shooting is not shown on the video as Rakeyia Scott points her cellphone at the ground and screams, "Did you shoot him?" She then runs closer to the scene, angling the cellphone camera this time at the spot where her husband was shot. Scott's body is seen lying in the street surrounded by several officers. The cellphone video was the first footage of Scott's deadly encounter with police to be publicly released. One of the attorneys representing the Scott family, Charles G. Monnett, said they released the video "in the name of truth and transparency." During the rally today in Charlotte, activists and religious leaders joined protesters' calls for investigators to release the videos. Corine Mack, president of the Charlotte-Mecklenburg NAACP, told the crowd amid cheers that the U.S. Department of Justice (DOJ) had launched an investigation into the case. The DOJ's Community Relations Service has said it is "is working to maintain open lines of communication and ease tension in Charlotte," but the department has not yet decided whether to open an investigation. A Justice Department spokesman said Attorney General Loretta Lynch's remarks from Thursday, indicating the department is monitoring the case, still stand. The Charlotte-Mecklenburg Police Department said its officers were searching for a suspect who had an outstanding warrant when they encountered Scott in a vehicle outside an apartment complex around 4 p.m. Tuesday. Police said Scott was not the suspect that officers sought but that he was holding a handgun, which investigators recovered from the scene, and posed a threat because he was not obeying police orders to remain inside his car and drop the weapon. Officer Vinson subsequently fired his gun, striking Scott, who police said was treated immediately and later pronounced dead, police said. Vinson, who has been employed with the Charlotte-Mecklenburg Police Department since July 21, 2014, and is currently assigned to the metro division. He has been placed on paid administrative leave while the investigation into Scott's death is ongoing, according to Putney. Vinson, who is black, was not wearing a body camera at the time. Scott's family maintains he was not holding a gun and he was just waiting for his son to be dropped off from school. Justin Bamberg, a lawyer representing Scott's family, said in a statement Thursday that it's "impossible" to detect from the police footage what Scott is holding and at no point did Scott appear or act aggressively.